Software Engineering: An International Journal is an open access, peer reviewed journal that provides a forum for software engineering research. The journal publishes all aspects of software engineering. Topics of interest include software quality, software metrics, software architecture and design, empirical software engineering, software testing, software requirement engineering, security issues, reliability models and methods for developing, verifying and implementing the systems, method engineering, software reengineering and component based software engineering. 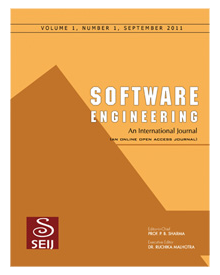 The journal encourages empirical studies in software engineering with traditional and innovative techniques, including machine learning techniques. Software Engineering: An International Journal also promotes the publication of experience based industry case studies that are significant and applied in practice and research. Finally it provides a forum for publication of research papers related to all aspects of software engineering.